Born into a family of musicians, Stela Miteva-Dinkova began studying the guitar with her father, Blagoi Mitev. In 1984, she was accepted in the Dobri Hristov school of music in Varna, Bulgaria, to study guitar with Lyuben Haralambiev. In 1996, she graduated the Academy of Music and Dance Art in Plovdiv, Bulgaria. She refined her performing skills in the master classes of Abel Carlevaro, Martin Renert, Nikita Koshkin, George Vassilev etc. A talented performer herself, she has won first prize at international music festivals in Dobrich, Albena (2002) and in Plovdiv (1994), where she was awarded for her classical guitar interpretation. At a national level, she has won first prize at Chirpan’s national Young Musician Competition twice (1985 & 1987). Stela Dinkova is a strong intercessor of Bulgarian guitar music. She compiled and published two collections of guitar music by Bulgarian composers “Pieces for the Guitar from Bulgarian Composers” (a book and CD set – the first of its kind) and “Pieces for Guitar” by Vassil Belezhkov and Vladimir Vlaev. She presented and promoted new pieces from Bulgarian authors on her concerts at festivals across Europe, America and Africa. She participates as a member and chairman of the jury of national and international competitions. Since 1996 she has been teaching at the Academy of Music, Dance and Fine Arts, Plovdiv, Bulgaria. 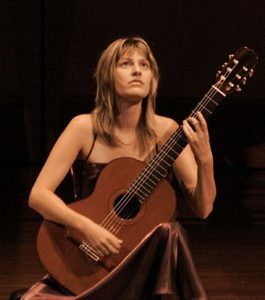 For her active concert activity and methodical book entitled “Typical skills in the guitar left hand technique” in 2009 Stela Dinkova was promoted to associate professor. Her students have gone on to win prestigious awards at national and international competitions and perform around the world. Member of the Foundation “The Fire of Orpheus” Stela Dinkova supports the young talents development as an organizer of International Summer Academy “The Fire of Orpheus” and a participant in the project Youth Academy “Creative Sparks” funded by the EEA GRANTS.